For the past 5 years a street game called Journey To The End of The Night has been played out in cities around the world. 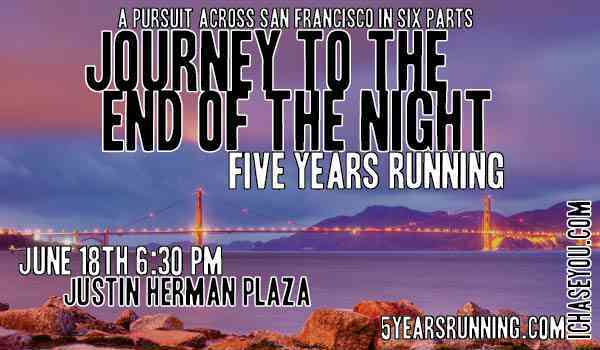 This time it returns home to San Francisco where it all began 5 years ago as an SF0 event created by Ian Kizu-Blair, Sean Mahan and Sam Lavigne. On June 18th, players will have to navigate through unique checkpoints scattered throughout the city while chasers try to tag them. Once tagged, players join the chasers, hunting down their friends and others. To make things more interesting, players may only travel on foot or by public transportation. Registration for the free game starts at 6:30 PM on Saturday, June 18th at Justin Herman Plaza in San Francisco. The game will start around 7:30 PM and will end before BART stops running. Bring some water, your running shoes, and some slow friends to sacrifice to the chasers.